The retail business or we could say the retail industry, in parallel with the multiple fold growth that it has witnessed over the years, has turned equally complex. And, with the ever-increasing consumer expectations and demands, the complexities are only projected to increase. Robotics Process Automation, popularly termed as RPA, is a natural solution to the unprecedented growth and the intricacies tethered to it. So, what is RPA? As the name suggests, RPA involves the use of robots to perform mechanical, recurring, or kind of monotonous business functions that are usually deemed to be time-consuming and ineffective on the cost front. These functions are automated through robots, trained by human beings. The retail industry is comprised of a lot of business functions, right from managing the fundamental inventory and getting them to the retail shelf, to further managing customer engagement, managing loyalty schemes, automating bills, managing customer complaints, generating a wide range of analytical business reports, etc. there are several business functions that could be automated with the help of a comprehensive and customized RPA solution. Automation Anywhere, one of the best and the most successful RPA solutions providers across the globe, brings its diverse experience and the latest technology to the benefit of retailers all over the world. Automation Anywhere’s RPA solutions are aimed at bringing tangible benefits in the form of saving man-hours, foster 100% accuracy in the processes, and contribute to considerable or huge annual savings for the organization. Automation, regardless of whether it comes through robots or anything else, is considered to be a disruption to processes that have been traditionally heavily reliant on manual intervention or governance. These aren’t exactly technical challenges, however, the ones that could confront the entire retail ecosystem. How? RPA relieves human intervention out of the clerical or monotonous operations, and therefore, it may be perceived to be an axe on the employment front, thus resulting in reluctance to acceptance at the grass root level. Of course, as every technology, initially, has always had some degree of hesitance, the benefits eventually helped it trickle down to the bottom, thus witnessing a gradual and sustainable acceptance. So here, retailers must understand two things. First - technology is the way forward, and a weaker or reluctant adoption towards it could lead the business nowhere. Second - people who’d be relieved out of the monotonous tasks could be used somewhere else, probably for the more productive, challenging and rewarding tasks. The next RPA challenge in retail could be that of training. Conventionally, retailers haven’t made huge or adequate investments in staff training. Most of them are trained on the job and then brought to the production floor. With RPA though, the scenario has to change. Retailers would be required to chalk out a considerable training budget to ensure that their otherwise low-wage and low-skilled employees graduate into a highly skilled and salaried people with accrued talent to fulfill high-end responsibilities and thus productive for their employer. Again, doing so would benefit retailers on two fronts. Higher employee engagement and retention, if the employees are assured of benefits of talent building in the long run, and subsequently for retailers to have high-end output resources in the system, and lower employee attrition or turnover rate. In the beginning, things may not be as flowery. But with the right training and implementation techniques and management across verticals and the hierarchy, RPA could certainly work wonders in the long run. RPA’s benefits in retail are associated with a quicker billing process, quicker, automated and accurate inventory management, managing customer information, generating sales reports through the real-time availability of business data helping business owners to make informed decisions. Besides, RPA also helps manage customer complaints in a better manner through automated incident handling, resolutions based on priority levels, and automating escalations to the higher-ups based on the severity of the concern. In a nutshell, RPA contributes towards better operational efficiency, coupled up with customer satisfaction. RPA is applicable in the following areas in retail management. Complaint management and others based on the concerns that exist, and processes that could be automated in the context of the respective business. Japan is a growing and developing market for the retail industry. Some of the prominent cities within the retail sector in Japan are Tokyo, Osaka, Aichi, Hyogo, and Kanagawa. FidelTech is Automation Anywhere’s official RPA associate in Japan, offering end-to-end RPA solutions including RPA sales, RPA requirement assessment, RPA customization based on the process requirements, output expected, along with RPA implementation and integration within the existing IT systems. FidelTech offers a strong RPA technical support in Japan, thus offering a comprehensive RPA proposition for the retail industry in Japan. 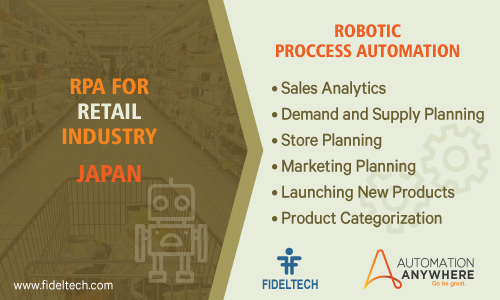 Retail companies in Japan can implement RPA for tasks and processes like -Sales analytics, Demand and supply planning, Store planning, Marketing planning, Launching new products, Product categorization. For more information on Fidel - Automation Anywhere RPA services in Japan, get in touch with us. Looking for Automation Solution in Retail Industry?